Our new home is an Umpqua by: Hayden Homes. Overall we are pleased with the design choices we made, and the quality of the house. It is twice the square-footage of our last house, including a second floor. We have plenty of space for all our stuff, and then some. We are all unpacked, and have decorations and lots of pictures starting to hang on the walls. Jennifer and I share a Pinterest board to collect various ideas we would like to implement throughout the house. The first floor is situated with all the amenities for family life. The entry way, laundry room, half-bath, kitchen, dinning and great room, and our master suite. The second story has individual bedrooms for each of our four daughters, a small common area, hall closet, and bathroom. Having a second story is a significant change for us. Here is how we live through some of it’s ups and downs. Girls got own room. They enjoy it over-all. Especially Zoë, she has a walk-in closet and has spent some time making decorations and setting up her room. 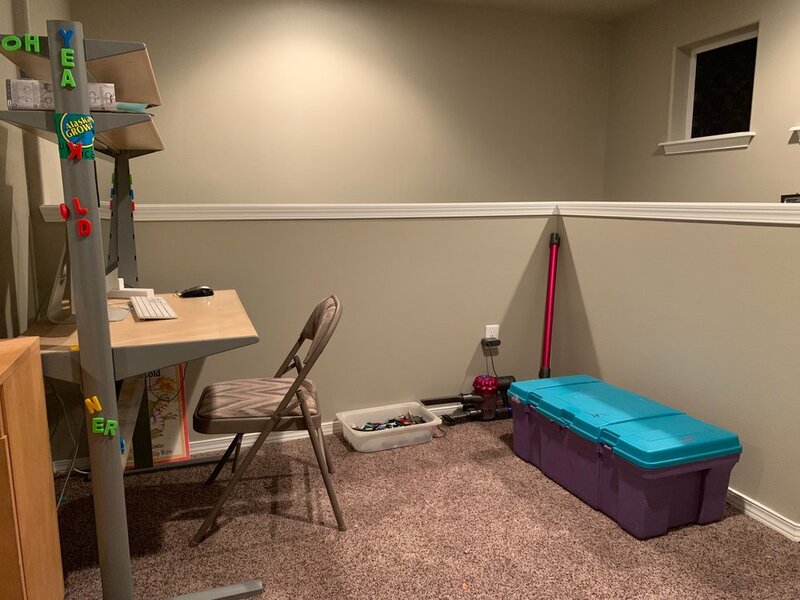 It includes a desk, although she prefers to sit on the floor, under a lacey cloth pinned to the walls to make a covering. She calls this corner her “Nerd Nook”. And Cinnabun has his own corner set up with a gate so he has plenty of room to roam, and his mess is contained, mostly. Looking up, on the left is a photo gallery of us. On the right are photos of our extended family. WIllow’s green dragon mask sits at the bottom of the stairs waiting to back to her room. Stella does not like to spend time alone very often. She spends her time with Sparrow or Willow in their rooms. At night, Stella often climbs into bed with Willow. Every night I talk with Stella about overcoming her fears and becoming brave. At first, she would declare that “she is not brave”. And I would explain that she can be brave. That she made through nightmares in the past, and she will be able to do it again. And each time, she is becoming more brave. I comfort her fear of being alone by reinforcing that she is never really alone because Jesus is always with her. She can ask Him to help her be brave, and He will because He has the power to do anything, and He loves her very much. Willow likes having her own room, and gets upset that Stella and Sparrow go in and play with all her stuff and make messes. Sparrow has grown to be very content sitting in her own room and playing on her iPad. When their friend, Lucy comes over, Willow’s room is the place to be. When Willow gets upset about the mess other people made, we discuss that she was also part of the fun that created the mess. Furthermore, I emphasize that she is ultimately responsible for any messes in her room, even if she didn't make them. I encourage her to set an example by putting things away as they finish playing with them, and encourage others to do the same. Situations like these have been great opportunities to discuss trust and respect. Following the Golden Rule is treat others the way you want to be treated, not treat them the way they treat you. They are still processing that logic. The girls bathroom is now big enough for everyone to be in there comfortably. Two sinks, and a enough drawers to organize their brushes, toothpaste, and hair ties. And we work on putting things back in their place, and cleaning up after themselves. Empowering them to address their own mess demands a lot of patience. It is easy to get upset that they left a mess. However, getting upset is not an effective way to motivate them to do so. The common has a desk with an iMac for the girls to play games and make movies. There is also a small table with the legos and chest of all the dress-up clothes. Over time, I plan on making appropriate shelves and furniture to utilize the space efficiently, and organize their stuff nicely. There is a cordless Dyson vacuum here, as well. It is small enough that the girls can use it to help maintain their rooms. It is also helps decrease the amount of times I have to carry up the full-size vacuum up the stairs. One other benefit of the second floor is we are all getting more exercise. Climbing stairs is a simple and good form of exercise. However, like many people, I felt reluctant to adding a new exercise routine to my life. I am 42 years-old and climbing stairs requires more effort than I remember as a child. Growing up I mostly lived in houses with multiple floors. I never thought twice about having to go upstairs if I needed something. I would bound up and down as if I had springs in my feet. Making a point to see how many stairs I could skip to make the climb even faster. Even though the climb gets easier over time, I look for ways to decrease the need to climb those stairs. The effort to climb the stairs has to be worthwhile! When Jennifer or I need to talk to one of the girls, we are grateful to have FaceTime to communicate. We can say what we need to say, and see what the girls are up to. A FaceTime call has become our modern day dinner bell. Someday, I would like an old-fashioned, steel triangle in the kitchen to use as an actual dinner bell. Often, when we are talking with one of the girls on FaceTime, they will point out that they can hear us from downstairs. However, I keep stressing the importance of face-to-face communication as more effective than yelling across the house at each other. Now we are working on not hanging up until we acknowledge the conversation is over. That being said, we still sometimes yell up the stairs for the girls to come down. Since all the girls toys are upstairs, inevitably their stuff coming down stairs. In itself this is not so bad, they are having fun outside, and we can enjoy watching them play in the living room. Frustration occurs when all the stuff does not make the return trip back upstairs. Jennifer and I trying to encourage their sense of responsibility for their toys by stacking abandoned toys, and clothes, at the bottom fo the stairs. We have a file basket to place the items in sitting on table. This basket gets overwhelmed often. We repeat often to take something with you when you go upstairs, even if its not yours. This is a behavior that has yet to be fully established. The basket has overflowed with items that need to make their way up the stairs. One design feature of our home that I would have changed is that the thermostat for whole house is located upstairs. There is probably a reasonable explanation for this choice, however, in practice I would have liked the thermostat to be located in the downstairs area for easier access. Here, there is a technology solution that addresses this little problem quickly, and easily while providing even more utility. Enter the smart thermostat. I replaced the standard thermostat with a Nest E Thermostat. I liked the look of it over the standard Nest. It is nice to be able to monitor and control the temperature of our house through my phone. I look forward to using the smart features of the device to keep the costs of heating and cooling our home low. As with many things in life, our experiences are both a curse and blessing mixed together. We are very grateful for the opportunity to live in this beautiful and spacious house. Recently, I accepted another opportunity that has influenced my perspective on living in a big house. On August 13th, I started working building tiny homes at Seattle Tiny Homes. The custom homes are built in a warehouse here in Walla Walla. The houses are beautiful. As I work in the houses, I think about how easy it would be to clean the whole house. Part of that ease would come from the trimming back of all my stuff, so that it would fit in a tiny home. For our family of six, we would need tow tiny homes, one for the living space and the master suit, and one for the girls. That wouldn’t be bad, the homes could be next to each other, and connected by a porch and breezeway. Or maybe, Jennifer and I will move into one when the girls leave home. Well, dreams are free, and abundant. The journey continues on my search for Ecotopia. Thank you joining me on this reflection on our living space. Come back next time! Home at last - living in two houses and two apartments, three cities, and two states in 7 months. Here's to crossing paths again! Sundown Hazen, LLC is a participant in the Amazon Services LLC Associates Program, an affiliate advertising program designed to provide a means for sites to earn advertising fees by advertising and linking to amazon.com.